Good night, sleep tight, don't let the bed bugs, rabid racoons, or guidos bite! 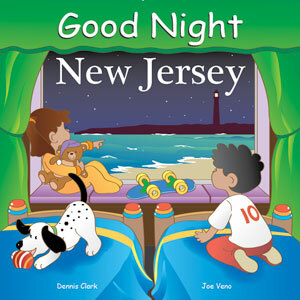 When I first heard of the book Good Night New Jersey, I assumed it was a depressing tale of some downtrodden loser aching for his chance to get out of New Jersey and say good night to this state once and for all. After borrowing Good Night New Jersey from my four-month-old niece, I found out that the book is nothing of the sort. Rather than being some dark story of someone trying to get out, the book celebrates all things New Jersey. It presents a whirlwind tour of the Armpit of America, from morning to night, culminating in the climactic, if rather predictable, “Good Night, New Jersey” ending. But before that, we say good morning, hello, greetings, good afternoon, and good evening to a variety of attractions throughout the state. The beach, a blueberry farm, Lucy the Elephant, Adventure Aquarium, and Asbury Park (with requisite Springsteen reference) are all visited. The book also pays tribute to the Lakota Wolf Preserve – something I didn’t even know existed. Good Night New Jersey is a quick, easy, and fun read. The pictures are very colorful and accurately portray the various New Jersey attractions. 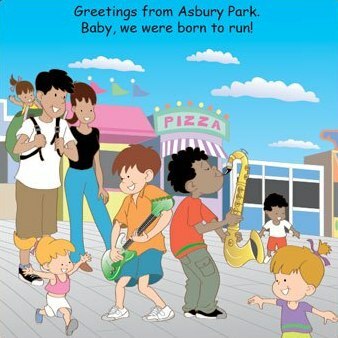 I think the book is a great vehicle for New Jersey’s youngest residents to take pride in their state. And it can be used to teach those mini haters from other states just how good New Jersey really is. Now I do have some criticism. The plot is pretty weak, and the dialog is kinda forced. (Example: “Good evening, state park where George Washington and his men crossed the Delaware River” – see what I mean?) And there were a lot of New Jersey attractions that were left out. Why not say “Good Morning” to the crackheads in Camden? Or “Good Night” to the prostitutes in Atlantic City? And how was there nothing about the Turnpike??? All that aside, Good Night New Jersey is a wonderful book. Though it’s geared toward New Jersey’s littlest inhabitants, it can be enjoyed by people of any age. And it can make anyone appreciate the state…until they come to their senses and want to get the hell out and say “Good Night New Jersey” for good. This entry was posted on January 25, 2011 at 10:53 pm and is filed under Reviews. You can subscribe via RSS 2.0 feed to this post's comments.